Gareth James – London Street Photography | Definitive Touch - Men's Contemporary Style. Gareth James of London Street Photography showcases some fantastically gritty local street photography. 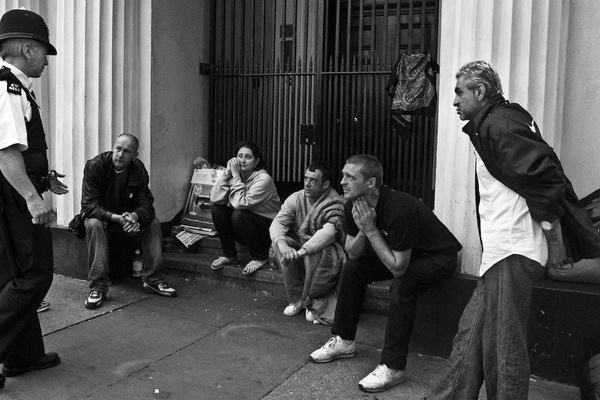 Candid shots of what looks like primarily London’s lower-middle class are featured throughout the series which is completely in black and white. Among other themes, the series explores drugs, homelessness, music, and crime. Glenn O’Brien explains the door with “This is not a brothel” sign. sheltered much? none of these people look homeless at all, hardly even “gritty”. @worm @rz. yea no kidding. come to Newark NJ we’ll show you some real homeless people. Love the fact my flicks made it up here.